Cast members at a rehearsal yesterday. 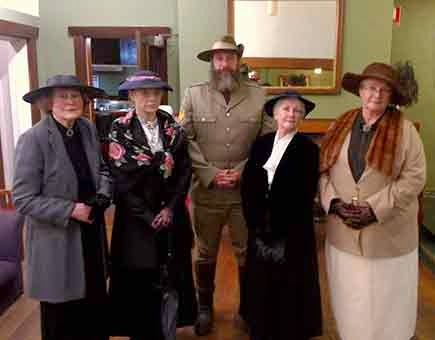 A NEW play based on characters and events in New Norfolk in 1915 will have its debut at the Derwent Valley Council Autumn Festival this Sunday. Written by New Norfolk's Sharon Hutchinson, Australia Will Be There is set in a time when Australia was in full support of England fighting off the enemy hordes in Europe. "Sergeant Major Wilberforce Shoobridge" will be rallying men to join up as volunteers to go and fight, while "Miss Coate", a former matron of the New Norfolk Asylum will be encouraging single young women to consider signing up to go overseas to serve as nurses. Other characters will include Mrs Dean and Mrs Shoobridge, president and treasurer of the New Norfolk Red Cross. Session times are 11am and 1pm. The play will also feature the Derwent Valley Choir singing the wartime anthem “Australia Will Be There” and other favourites of the era. The play is the first in a series of productions planned for the next few years in line with developments that occurred during World War I. Reader's letter: What's the address?